This report outlines the progress made in implementing Local Area Coordination in England and Wales between 2012 and 2015. Early development sites are demonstrating significant improvements in the quality of people’s lives while also providing savings to public services. 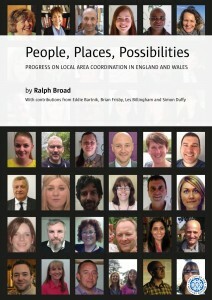 Huge thanks to Simon Duffy and Centre for Welfare Reform for publishing the new report on Local Area Coordination – People, Places, Possibilities. You can read or download it via the Centre website here. My thanks to everyone who has contributed and for all the fabulous work of Local Area Coordinators, Managers, Leaders and especially local people who have welcomed us into their lives, shared their stories and embarked on a journey to building a better life and stronger, more welcoming and inclusive communities. Now….let’s keep learning from our amazing communities and supporting inclusion, citizenship and social justice for all. - Citizen Network webinars....and more! The summative evaluation of the Local Area Coordination programme in York has now been published. The evaluation was compiled by the University of York. © 2018 Community Catalysts CIC. All rights reserved.